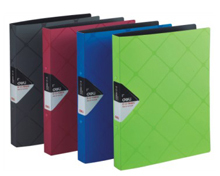 Our ring clip file is a type of file holder which is mainly used to keep A4 paper documents. It is available in 2 holes, 3 holes, and 4 holes for customers to choose from. Our ring clip file is made from material which is provided by qualified suppliers, therefore, its quality and reliability are highly ensured. As a specialized ring clip file manufacturer in China, we at Deli Stationery have been devoted to producing quality products and protecting environment since our foundation. Through more than 20 years of tireless efforts, we have been awarded the ISO9001:2000 and ISO14001:2004 certificates. Today, our office supplies like stapler, paper punch, binder clip, clipboard, paper trimmer, etc. are reliable, economical, and thus are well received in the USA, Canada, Australia, Britain, Germany, Italy, France, to name a few.